With a laptop holder, the notebook is raised 18 degrees for more comfortable viewing and typing. Hollow out design to keep laptop heat dissipation well. Foldable ultra slim lightweight and portable. 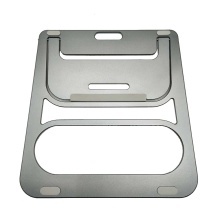 Aluminum alloy construction makes this laptop stand resist rust and corrosion. Rubber front lip and pads on the stand preventing notebook from sliding off the stand.